Before starting the tutorial, you should be clear on the concept of arrays. An array is one type of variable that can store a list of data. When you want to store a group of data in a single variable then you can use an array variable. Every value of the array can be read by the corresponding array index. 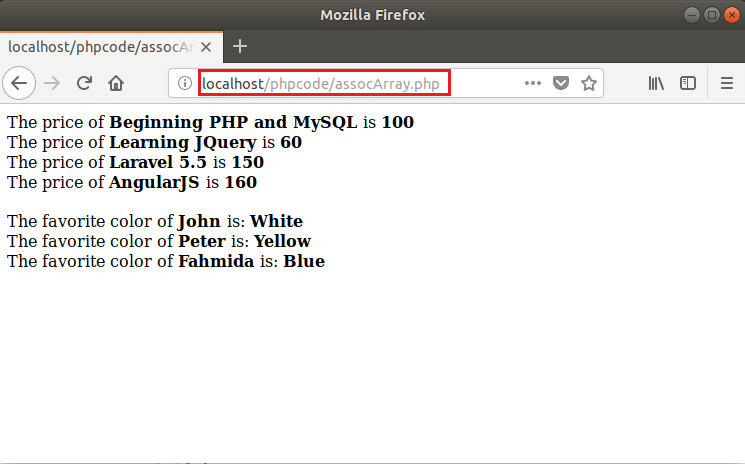 Three types of array variables can be declared in PHP. These are numeric array, associative array and multidimensional array. Numeric Array: The index of the array is number. Associative Array: The index of the array is string. Multidimensional Array: Array contains one or more arrays as elements. In this tutorial, you will learn how you can declare and use arrays in your PHP script by using different examples. You can declare numeric arrays in various ways, such as, defining an array structure, using array() method and assigning values. These declaration are shown in the following example. 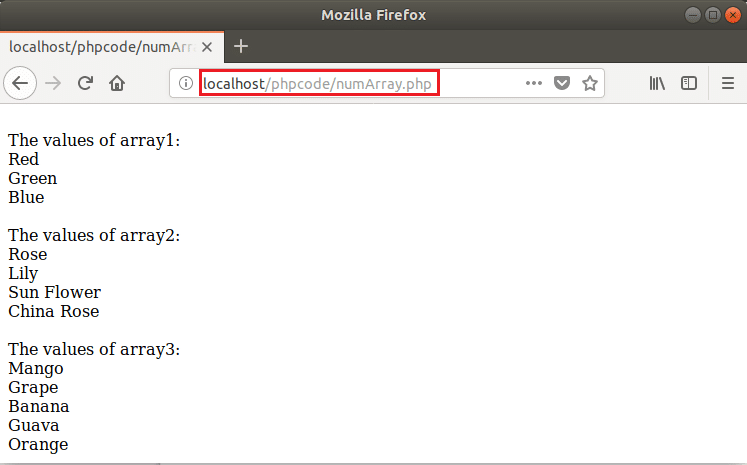 Open a text editor and creates a PHP file named numArray.php and add the following script to know how numeric arrays work. Here, a for loop is used to traverse each element of the array. You can use any of the three declarations to create a one dimensional numeric array in your script. Now, open the browser and browse the location to run the script. You will get the following output if the script executed properly. The declaration of an associated array is similar to a numeric array. You can declare a numeric array without defining the index but you can’t declare an associative array without defining an index. You have to define key-value pairs properly at the time of associative array declaration and the key or index value must be a string. 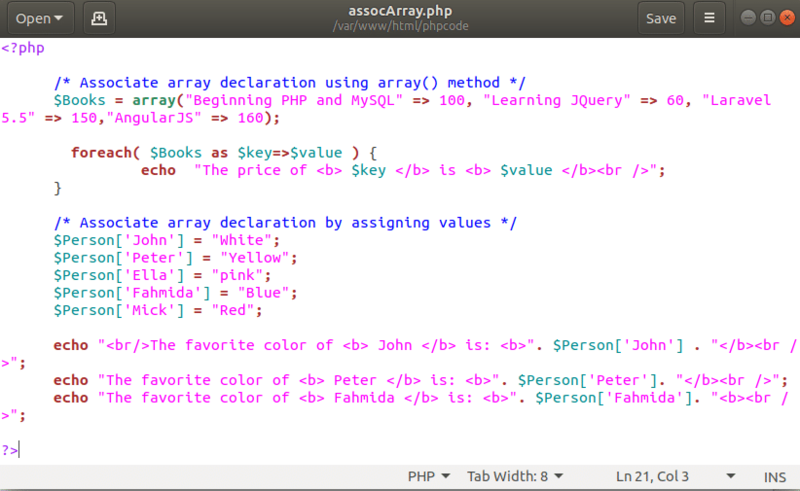 Create a php file named assocArray.php and add the following code to show the use of associative arrays. Two ways of associative array declarations are shown in the following script. array() method is used first to declare an associative array and for loop is used to read key-value pair. The second associative array is declared by assigning values and array values are read and printed separately. Now, open the browser and run the script. You will get the following output if the script is executed properly. One or more arrays can be used as array elements of the multidimensional array and array elements can also contain another array(s) as elements. You can use multiple indexes or for loops to access the values of a multidimensional array. How you create and use multidimensional arrays in PHP are shown in the following example. 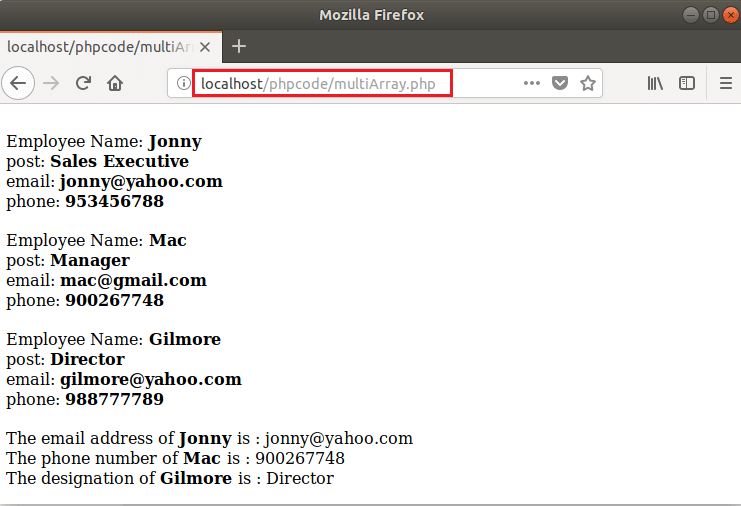 Create a new PHP file named mutiArray.php and add the following script. Array values of two dimensional arrays, $employees are read by using multiple for loops and multiple indexes. You have to use two for loops to read the values. Here, the first loop is used to read the main array and the second loop is used to read the values of the internal array. If you want to access the values of multidimensional array without using a for loop then you can access the values by using multiple indexes which is shown in the last part of the script. Run the script from the browser. You will get the following output if the script is written properly. You will need to use different arrays in your scripts to solve various programming problems. By practicing the above examples, you can understand properly how you can use array variables in php.